On Monday 12 December, the mission of interventional paediatric cardiology of La Chaîne de l’Espoir was a first at the French Medical Institute For Children and Mother in Kabul. Dr François Sassolas, paediatric cardiologist for thirty years at Louis Pradel cardiology hospital in Lyon, was on a one-week paediatric cardiology mission in Kabul. 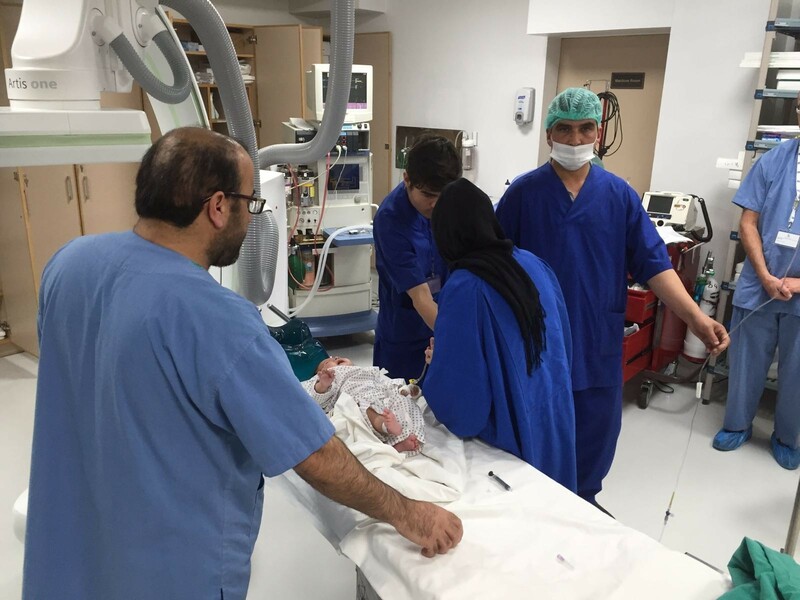 Accompanied by Dr Etemadi, interventional cardiologist at Nantes CHU and also volunteer at La Chaîne de l’Espoir, and Afghan doctors Dr Rafi and Dr Jamshid, Dr Sassolas performed the first dilation of the pulmonary valve on a little 3 1/2-month-old girl weighing 4.5 kg. Look here for Dr Sassolas’ account. >> Can you tell us about the surgery you have performed on this child? 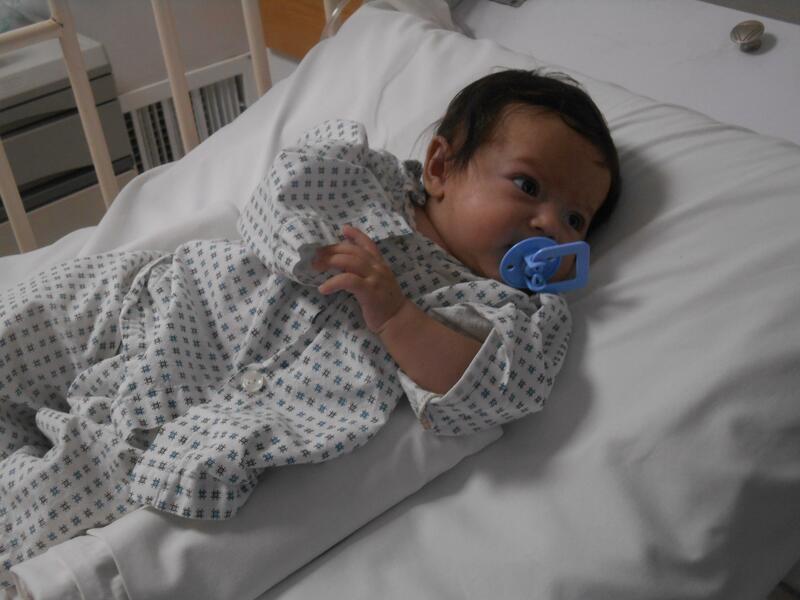 Little Taheba was suffering from a very strong narrowing of the pulmonary valve called “critical pulmonary valve stenosis”. Her life was in danger because this defect prevented the good oxygenation of her body. The surgery consisted in dilating her pulmonary valve with a catheter and a cuffed tube so that she could have a normal oxygenation. >> Is it a complex procedure? It is rather a delicate process as the intervention has to be done quickly due to the child’s precarious state: it is intubated, under general anaesthesia and with a bad oxygenation during the act. At first the operation even deteriorates its condition during a few seconds before correcting the malformation and enabling the child to have a normal oxygenation. >> What would have happened without your intervention? The intervention was necessary to avoid a further deterioration of the child’s condition in the coming months resulting in her death. Hopefully, the operation went really smoothly and well. The little girl walked out of the hospital the day after the operation. Her family was very happy and Taheba is doing wonderfully. >> What’s next for this baby? Any treatment or follow-up? Dr. Rafi has made an appointment with Taheba in ten days to check her condition. After that, she will have a last appointment three months later to ensure that she is in good health. She will then be able to live a normal life.